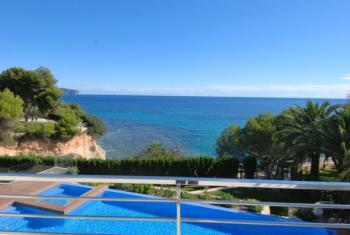 Impressive villa a few meters from the sea, with a constructed area of 650m2 distributed over 3 floors. The basement floor has a 43m2 garage, a billiard room, spa area with sauna, gym and a bathroom. The ground floor is on the same level as the large pool with heating and cover. There are also several parking places and large terrace with garden. Inside the house distributes in: living room with fireplace, kitchen, one bedroom with bathroom and dressing room en suite, laundry and one more bathroom. On the upper floor you find 4 more bedrooms with 4 bathrooms en suite. For greater comfort, there is an elevator, home automation and alarm system.